The average annual precipitation (rain, snowfall, etc.) from the ERA-Interim data (years 1990-2002). Three-hourly precipitation amounts from this data source are used in the calculations with the FLEXPART model. As wash-out is much more effective than dry deposition, precipitation has an important influence on the consequences of nuclear accidents. Mountain regions have more precipitation and therefore also a higher risk for ground contamination. Most parts of the Mediterranean, especially the southern areas, have very low precipitation. 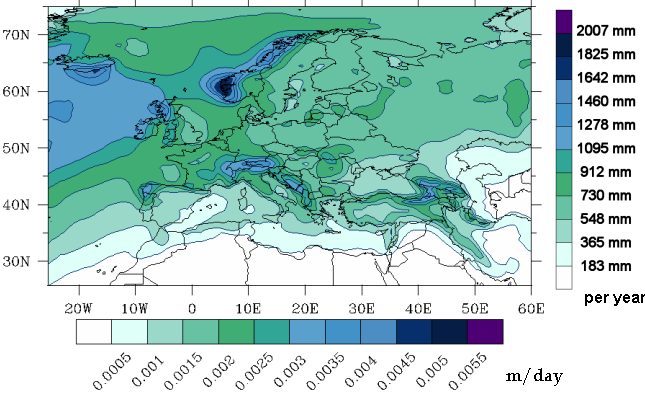 Western Europe and especially the northwestern coasts have more precipitation than Eastern Europe.